Apple cider vinegar is one product that can give any hair brand a run for its money. I say that because it is fast proving its benefits when it comes to skin as well as hair. Apple cider vinegar is an excellent product to have your hands on if you are craving to make your hair healthy and shiny. Apple cider vinegar has showed to be excellent to promote hair growth too. It balances the hair as well as the pH of the scalp, it clears all the product build up, hair loss and also dandruff. The result of rinsing the hair with Apple cider vinegar is simply smooth, shiny and silky hair. People do use plane vinegar to rinse their hair but apple cider vinegar dos a better job in terms of results as opposed to plane vinegar. The reason being Apple cider vinegar is considered to be the mother of all vinegar’s. Apple cider vinegar is a rich source of probiotics. 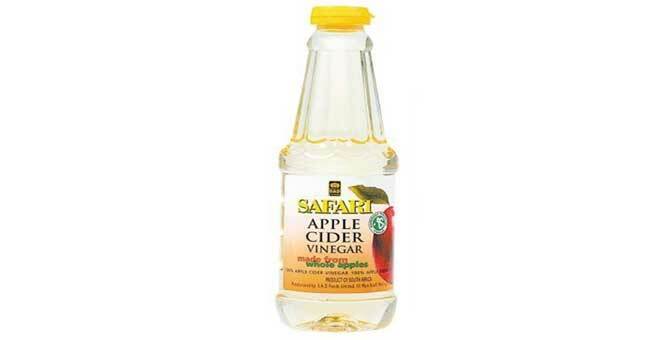 The apple cider vinegar contains minerals and enzymes that other vinegar’s probably may not have. Basically Apple cider vinegar works by restoring the luster and that happens when the hair is free from all the impurities and unwanted product build-up. It makes the hair smooth and silky and thus it will be tangle free. Our hair basically has a pH of 4 to 5. The acidity of this mixture helps in maintaining the pH balance of the hair and eliminates the build ups too at the same time. The several hair products available in the market contains severe alkaline that have bad effect on the hair. The usage of high alkaline or acidic shampoo will result in the hair becoming brittle, dry and that will make the hair break off easily. Apple cider vinegar encompasses certain mild acids as well as enzymes which help in destroying the bacteria present in the scalp. These bacteria which are caused due to sweat and impurities give rise to dandruff as well as itchiness. When hair follicles get clogged, dry flakes are formed on the scalp, and that’s thanks to the bacteria. If the scalp is dry then this makes the hair weak and that leads to hair fall. Rinsing your hair in Apple cider vinegar solution can help you to eliminate the bacteria which are the root cause of all issues. To promote healthy hair the basic necessity is to maintain a good blood circulation to the hair follicles. Better the blood circulation to the hair follicles that much good would be your hair growth. So how can you use apple cider vinegar to rinse your hair? All you need is warm water and apple cider vinegar. Just take one part of warm water and add one part of apple cider vinegar and mix well. Make sure the water is just lukewarm, not hot nor cold. Wash your hair with shampoo as usual, once you are done, apply the apple cider vinegar solution that you made little by little. Work it in the hair and then wash it off with plain water. Apple cider vinegar can be mixed it with baking soda to make the hair shinier. As it softens the hair, naturally it helps in reducing the split ends too. How to select a good apple cider vinegar? Not all apple cider vinegar available commercially are good for hair. It should be raw unpasteurized brand apple cider vinegar. Make it a point to check if the apple cider vinegar that you are buying is organic. That is because organic apple cider vinegar is made of organic apples which means it is devoid of fertilizers, harmful chemicals, pesticides etc.